The Kaiser’s Navy introduced our Second Great War setting and brought Imperial Germany’s High Seas Fleet into the 1940’s. Its publication was a turning point for Avalanche Press, as we started to figure out how to present alternative history the way fans wanted it. The Kaiser’s Navy is built around what was, at the time we first conceived it, our standard sheet of playing pieces for naval wargames: 70 long pieces and 140 square ones. Almost all of the “long” pieces all represent Imperial German warships, both old veterans of the Great War refurbished to fight in a few one, and new ships built in the 1920’s and 1930’s. The remaining “long” pieces go to German aircraft-carrying zeppelins. Like other Second World War at Sea games and expansions, the square pieces go to smaller warships – minesweepers, armed merchant cruisers and the like – and for the most part, to aircraft. The airplanes of The Kaiser’s Navy are all Imperial analogs to those fielded by Germany in that dark-mirror timeline, dressed up in a new Imperial color scheme and usually with slightly different designations reflecting the corporate survival of their manufacturers. We printed The Kaiser’s Navy as a standard 64-page book like many others in our line, with a full-sized sheet of laser-cut playing pieces. The supplier we used at that point left scorch marks on many of the playing pieces, and we gave the Imperial Germans a black background to cover those. Later print runs switched to a different supplier of laser-cut pieces, one who did not set his wares on fire before shipping them to us. 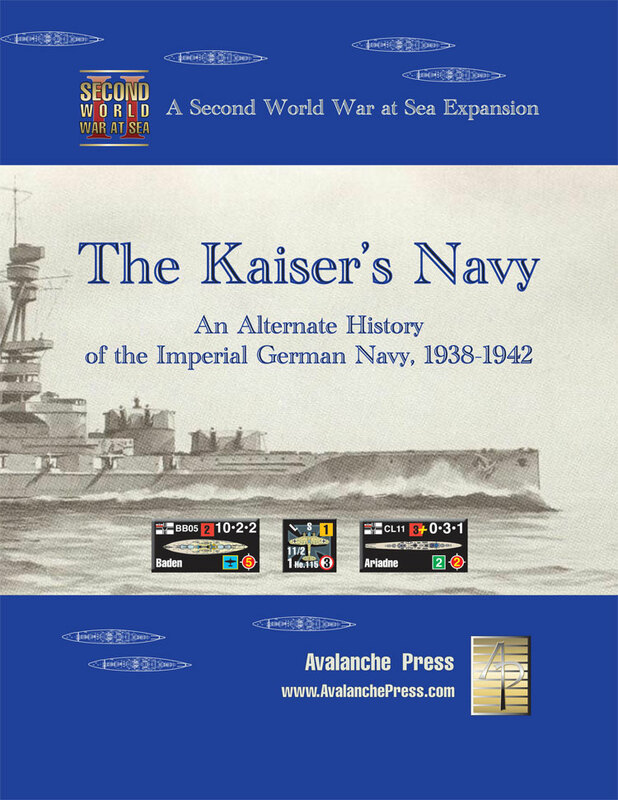 We took The Kaiser’s Navy out of print when we believed we had run out of books, with no intention of reprinting it. And then, looking for a box of Sword of Israel scenario books, there was one of The Kaiser’s Navy nestled behind it. So we’ve ordered up a fresh set of laser-cut pieces to match (the kind that haven’t been set on fire). There aren’t many copies – it’s just the one box full – and when we’re done with them, this time we really won’t reprint. So why not bring it back? I initially saw The Kaiser’s Navy as very similar to a series of stand-along downloads we had done, that took place in an alternative World War II but did not really interlink. Since they were “drop in and play” modules, the technology of their ships and planes had to match that of the base game (Bismarck in the case of The Kaiser’s Navy), since they would be fighting against and alongside ships and planes published for the historical scenarios of the base game. It was a necessary compromise, but one I never really liked, since it seemed to just present different colored pieces for the same sort of battles and campaigns. Alternative history should be, to my mind, alternative. I also wanted more battleship action, and that meant finding some plausible reason to hand-wave all of those nasty airplanes away. The Second Great War setting involves a world where aircraft are less advanced than those of our own in 1940, with rotary and lighter-than-air flight taking a far more prominent role. That takes away much of the threat to battleships from airplanes, and also helps suppress that of submarines (helicopters and airships are very potent anti-submarine warfare platforms). That makes this final, tiny reprint the last appearance of the Kaiser’s naval air force, and many of his ships as well. When they return someday, they won’t have large aircraft carriers, dive bombers or high-performance fighter planes. And the scenarios will of course have to be totally different, since they’ll draw on a different set of pieces for starters. All of which leaves The Kaiser’s Navy as a unique item: it’s a drop-in-and-play module as originally intended, one that lets you insert the revived High Seas Fleet into the battle for the North Atlantic. The scenarios are pretty battleship-heavy anyway, and there’s a lot of aircraft carrier action, too. Plus zeppelins delivering Stukas on long-range strike missions, something you won’t see in current Second Great War scenarios. While the aircraft are simply Imperial versions of those that served the National Socialists, the ships are either original designs or modernized versions of the ships that fought at Jutland. The latter were pretty easy to envision, since many nations rebuilt older warships for service in the new conflict. The new ships track closely to German design practice; German naval architects were a conservative lot and the legendary battleship Bismarck, for example, is clearly an updated version of the L1 fast battleship design first unveiled in April 1916 as a proposed successor to the Bayern class. The new ships of The Kaiser’s Navy take those built or proposed for Nazi Germany and apply a little more Imperial conservatism: thicker armor and more conventional power plants. They are in many cases more heavily armed, and they avoid the insane compromises of the Plan Z designs. I think the reasoning behind the ship designs is fairly sound and does reflect what an Imperial Navy might have built in the 1930’s. The Kaiser’s Navy is a fine product, and only going out of print because the Second Great War story line has taken a different tack. It adds a lot of fun to Second World War at Sea: Bismarck – with the much larger Imperial surface fleet in action, surface battle is much more likely than in the base game, which relies on its very tense cat-and-mouse interaction between raiders and raider-hunters. And you get Stuka-carrying zeppelins. Click here to order The Kaiser's Navy right now.